This photo was taken 4 years ago. Viva hadn't joined the family yet, and Kenzo was still an adolescent. On it are our youngest grand-daughter, Lucia, only 1 year old, and her mother. It made me happy Lucia was growing up with "a dog". I hoped, it would become a just as important and large part of her life, as it was for me, growing up with the dogs of my own childhood. It was not allowed to last, it seemed. Her parents, witnessing several incidents with other dogs, although not involving Lucia, became mistrustful of dogs in general. Including Kenzo. The blooming friendship between him and Lucia, was abruptly canceled. You might not expect this, but I thought their newly found distrust wasn't a bad thing at all. Even if it meant I had to keep Kenzo - and later Viva - physically separated from them and Lucia, I had to give them their own time to learn and get to know how to let kids and dogs safely interact. They asked me for guarantees, which I never gave. But I offered help and repeated what I always felt was best. Never leave them alone together, supervise each interaction, and teach (y)our child how to interact with dogs. Time passed in a status-quo, until Viva, with her outgoing nature as a cuddle bear and her calmness, was the first to de-ice them. 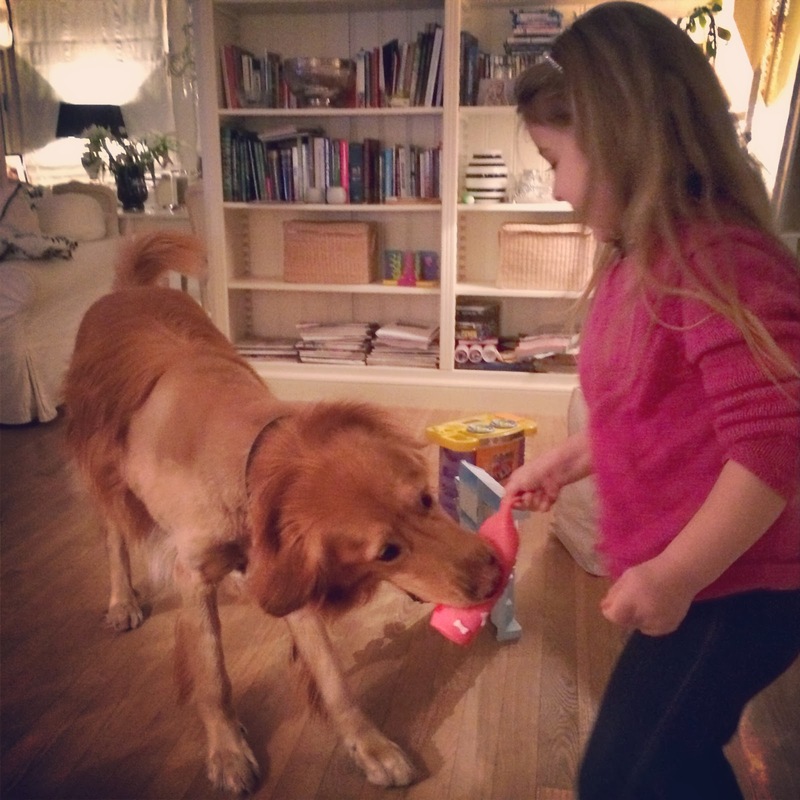 She was a great help in teaching Lucia that a dog is not a toy, but a living creature with its own personality. It made me sad that Kenzo, unlike Viva, was still looked upon with distrust, as they thought he was dangerous, with all his barking and guarding. They never understood, he was merely protecting them too, as he did for the rest of his family. I never shared my sadness with them before now, as I realized they needed to find their own way. Lucia in the mean time became fascinated of Kenzo and Viva. Both became equally important to her, and one of the main reasons why she enjoyed her visits. Even when she could only see Kenzo from a distance behind a baby-gate, or gaze in awe at him during a walk. Slowly, step-by-step, Lucia's parents learned to appreciate Kenzo more, by small "incidents" like the next. I remember how Kenzo once sneaked up behind Lucia, when the baby-gate was left open by mistake. She felt someone was sniffing the back of her head, and when she turned around, stood nose to nose with Kenzo. She put both hands in front of her eyes - an inventive response to what we told her never to stare a dog directly in the face - and said "Hi Kenzo!". Kenzo licked her face, and settled down right in front of her. I could see how everybody exhaled, and Kenzo just earned a new installment to his "trust"-fund. When Viva passed, they witnessed the unexpected impact it had on Lucia, now 5 years old, and realized what an important part in her young life, Kenzo and Viva already had become. I was grateful to see how they allowed Kenzo to step in, and support Lucia in her grief over Viva. Words were not spoken, but I knew this was the moment, Kenzo was granted the benefit of the doubt. No need to tell you, it went very well, and a friendship was renewed in the blink of eye. And so I leave you with this recent photo of Kenzo and Lucia playing. It warms my heart, all our hearts, seeing those two finally together again. I say it with a huge sigh of relief too, that patience finally paid off and ensured all involved felt comfortable with the situation. Lucia makes me proud when I see how she interacts with Kenzo. As we taught her, she waits for Kenzo to initiate contact and doesn't impose herself on him. Most of all I am thrilled on Lucia's behalf, to experience the blessing of a dog's companionship while growing up, receiving unconditional love, learning empathy, responsibility, respect and understanding of animals. I lay down with Kenzo in the snow, while children shout in excitement around us. The chilling air feels clean and fresh. The bright sunlight reflecting on the white landscape forces me to shut my eyes. And there she appears, being silly and romping around. The first snow was always our highlight of the year, and I squeeze my eyes even more to hold on to the image before it will fade, and I have to open my eyes again. Life has returned to its regular routine almost three months after her passing. She visits me still, in waves. I don't know when she will come next. This time it just took a snowflake. Sometimes she comes during the day, and other times in a dream. I am thankful for each visit. Cherished as an unexpected opportunity to again feel that love that once was. Promise me, soon to visit again, Viva.